Eye On Sports Media: Is Rick Majerus the One, True Billiken? 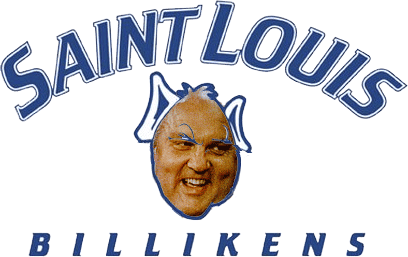 Is Rick Majerus the One, True Billiken? Unlike fellow Jesuit university Georgetown and its Hoyas, and the MAAC's Manhattan College with its Jaspers, the answer is more straightforward. In fact, a whole page of the school's media guide is dedicated to the explanation, which is as follows. 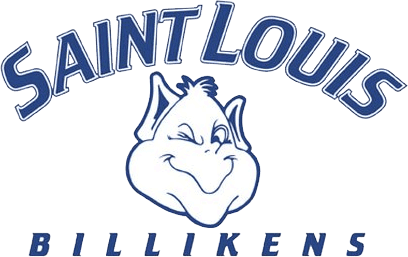 One of the truly unique mascots in college athletics, the Billiken is a symbol of good luck that became a national craze in the early 1900s. In 1908, Florence Pretz, an art teacher and illustrator in Kansas City, Mo., received a patent for her version of an ancient Asian figure – a chubby character with pixie ears, fat cheeks and an ear-to-ear grin. A year later, the Billiken Company of Chicago adopted the likeness, giving it its name. Initially manufactured as a bank and statuette, the Billiken reached its peak of popularity in 1911, when it was widely recognized as a universal symbol of good fortune. How the name became associated with Saint Louis University remains a hotly debated issue. Whatever version you accept, it happened between 1910 and 1911 at the height of Billikenmania. After practice, McNamara drew a cartoon of Bender as a Billiken, posted it in a local drugstore window and tabbed the football team “Bender’s Billikens.” The sporting public took up the name with such enthusiasm that it soon became the official nickname of all SLU teams. Legend has it that the Billiken has three kinds of luck – good, better and best. To buy a Billiken gives the buyer good luck. To have one given to you is better luck. The best luck comes if the Billiken is stolen. A chubby character with pixie ears, fat cheeks and an ear-to-ear grin? Except for the pixie ear part, could it be that Majerus might be the reincarnation of the original Billiken?